We are now taking applications for the 2019 Poker Float! 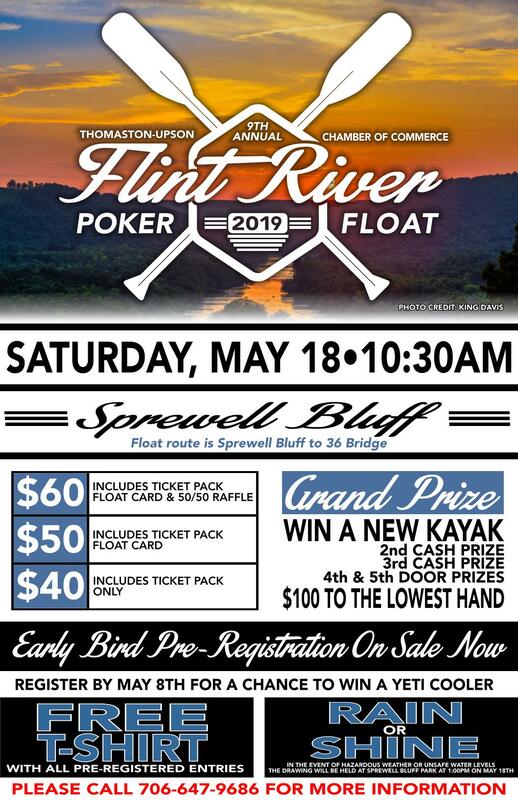 CLICK HERE for the Poker Float Registration Form. CLICK HERE for the Poker Float Rules & Regulations. We hope to see you on May 18 at Sprewell Bluff Park! The Thomaston-Upson Chamber of Commerce held its' annual Flint River Poker Float on May 19, 2018. Participants of the Poker Float paid to play poker on the Flint River. The participate with the best five-card stud hand won a new Kayak from The Outside World/Columbus. Second Best Hand won $250 and third best hand won $150. We even had a $100 bill for the floater with the worst possible poker hand. The event was a blast this year and was well attended by avid floaters of the Flint River, as well as participants that come from all over the state of Georgia. We invite you to make plans to float the Flint River with us next year!